Good things come to those who wait. It's true. I've been waiting a while, but finally a few of the big items on my "Wish List" fell into my lap over the weekend. If only we'd won the $70 million Lotto as well. Oh well, there is always next week ;). I have been dreaming of a round white shabby coffee table for ages. It has been top of my list. 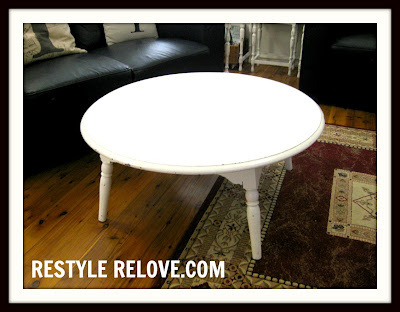 Here in Australia round wooden coffee tables are not sold in any regular furniture shops and are rare even on eBay. I know this because I watch eagerly for one every day. So I was driving home on Saturday after a pretty poor garage sale trip, when I saw another garage sale sign. I decided to check it out. Wow, am I glad I did. Here is my new $10 shabby white round wooden coffee table. I'm not even going to repaint it. I love it just they way it is. Yes, I'm super duper happy!!!! At the same house I noticed a gorgeous white single bed. 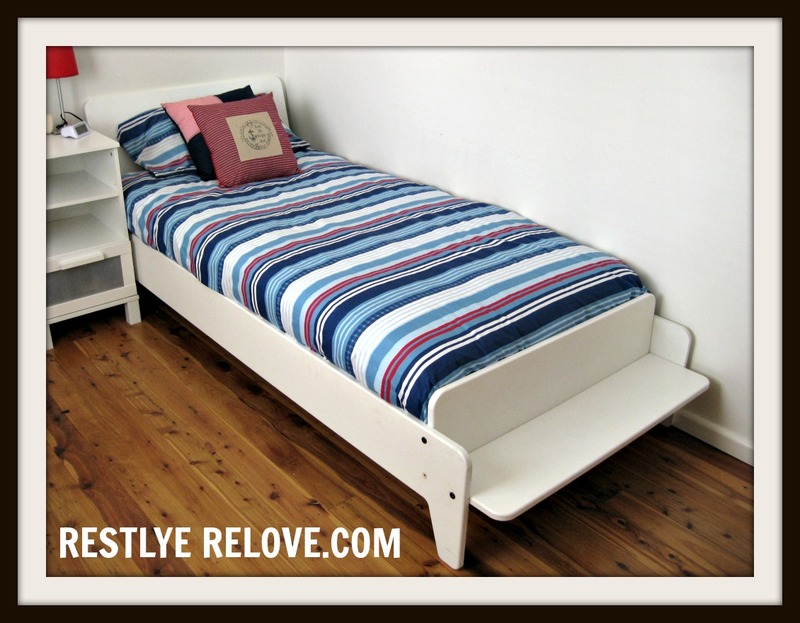 I have been wanting a new bed for my son because the current one we paid a fortune for at Domayne is ugly and too big for his small bedroom. This one was perfect and in like new condition. And what a bargain for only $40!!! It is a lot smaller and fits much better in his room. And the third item I got this weekend was a wardrobe for my son. All our rooms have built ins and his didn't. But now he is 3 and has almost as many clothes as my 5 year old daughter, a chest of drawers just wasn't practical. Plus I find it easier to hang the kids washing on hangers to dry, and then pop them straight into their wardrobes. Then I iron them on the morning if we are going out. I had my eye on a wardrobe last week and was out bid, then another one sold out from under my nose on a Buy It Now. I knew not to be disappointed and if I just waited another one would come along, and it did. 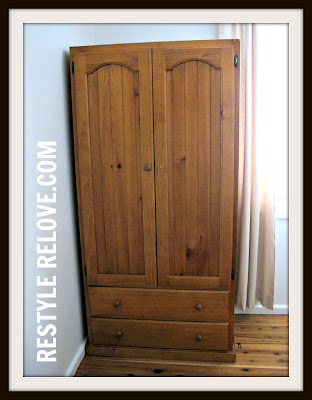 A lovely guy on eBay sold me this beautiful solid wood wardrobe which is perfect for Lochie's room. At this stage I'm not sure if I will paint it white or not. Lochie loves his new furniture. I will do a full makeover and repaint his walls shortly in the same creamy coffee colour as the other bedrooms, but in the meantime we have all the big furniture items covered so I'm happy. Our entire house is coming now together so beautifully and my Wish List if getting shorter and shorter. I still need to finish painting my daughters DIY board and batten walls (hopefully tomorrow), and I completed her new dresser this evening. 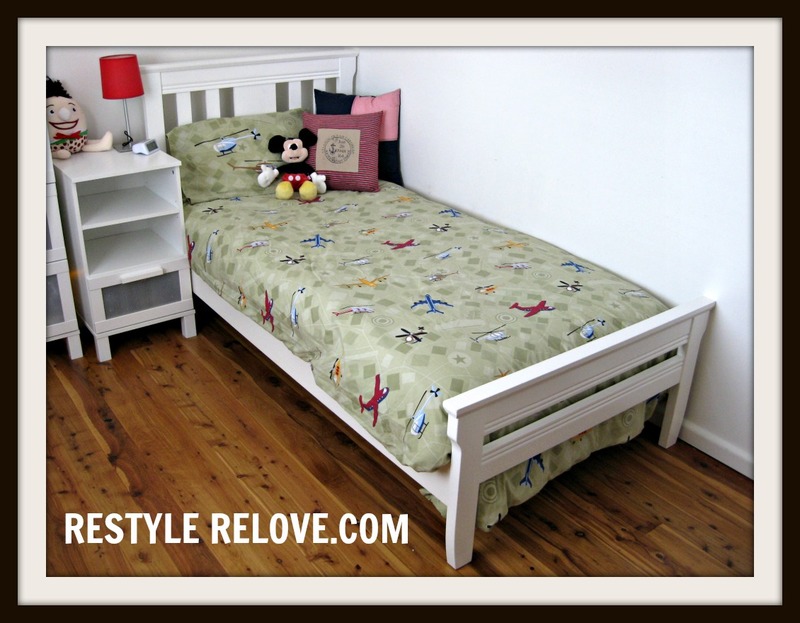 I also need to finish the board and batten walls in our main bedroom and add a few final finishing touches. I've also started to convert the garage into a study. This is a huge job but I've done my research and am confident I'm up to the challenge. I'd also like to repaint the lounge and sun rooms, and do the board and batten details in the entryway and down the hall leading to the bedrooms. Hope you all had a great weekend. Did you find any items to tick off your Wish List? Julie congrats on finding you table.Yes sometimes you have to be patient you will find what you are looking for.I am on a budget so sometimes it takes a little longer to get what I want.But it is always worth the wait! My Fabulous Little French Foot Stool! Somebody Pinch Me Now Please!